Before I get into my Vietnamese Rice Paper Rolls recipe I want to share some really frightening statistics this morning, courtesy of Bunny. Eats. Design. This is the one though….. This is not referring to a lack of literacy in the slightest, but a lack of love for reading. My parents read to me all the time, and in turn I read to my kids daily. It’s something nice to do, and it passes the time. Obviously, they have their books and I have mine, but I get to climb into bed at the end of the day, after hiding the ‘Big Book of Dinosaurs’ in hope of being able to read a different book for D Man tomorrow (I cant be the only one that does that? ), and open my book of choice and disappear from my suburban monotony bliss into whichever heady world I choose. I adore reading. I adore words. I guess that’s why I love the sound of my own ‘type’ so much, but to imagine a life without being able to slide into an imaginary world at the turn of a page, doesn’t bear thinking about. I just finished Julie and Julia, by Julie Powell. You know, the one they made the Meryl Streep movie out of? Hardly War & Peace but a very fun and funny read. Let me tell you, as one would suspect, the book shat on the movie. The reason for this is because Julie Powell, the author/crazy woman who tackled every recipe in Julia Child’s ‘Mastering the Art of French Cooking‘ in 12 months is quite naughty. She’s candid, she swears like a trucker and she had a gustatory baptism of fire that she is very honest about. Harvesting bone marrow and killing a lobster are not for the faint of heart. I think it struck a chord due to the very nature of the book (cooking/blogging/eating/drinking). The book was also realistic about the fact that all that butter-laden French food made her arse balloon. I found it unbelievable in the film when Amy Adams maintained her svelte appearance regardless of the lashing of cream and duck fat she scoffed daily. Anyhoo, read my peeps. Read. It’s better than TV. It invites your imagination to spark and not be spoon fed imagery. Don’t get me wrong, TV has a place, but don’t let it be the only form of entertainment in your home. Reading to your children is proven to increase their intelligence, and comprehension. The experts say that children need 1,000 stories read to them before they begin to learn to read for themselves. Sounds like a lot? It’s just three stories a day over a year (according to Huggies). Ok, off my soapbox…all that ranting has made me peckish so I thought I’d share another of my Spring To Do List recipes. 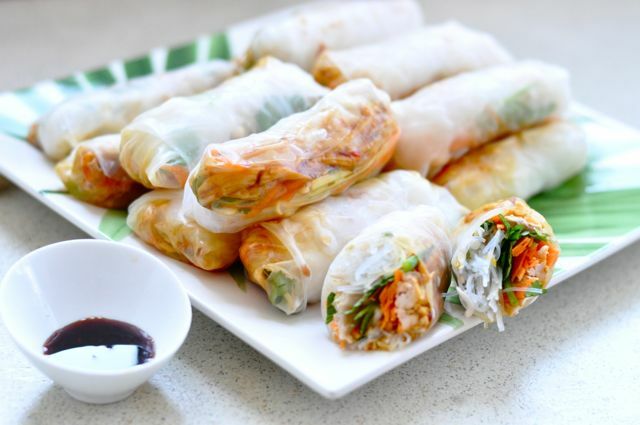 I love these fresh spring rolls. 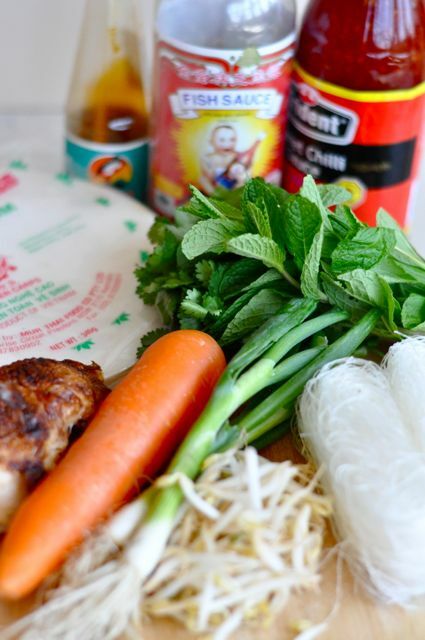 We sometimes go to a roll-your-own Vietnamese restaurant in Newtown, Sydney, but making them at home is so simple, delicious and healthy. Traditionally, the Vietnamese use pork and prawns in theirs, however, I’ve also had lemon grass beef, and sugar cane prawns. I was making these for a picnic so I kept it quick and easy……..my two favorite ingredients to any recipe! I’m always disappointed when they have too much noodle action and not enough filling action so you can make your own ratio up to please your palate…..but, trust me, my way is really yummy! I also put the sauce inside for ease of little people, and big people, eating outdoors, but you can make a separate dipping sauce if you want. Set yourself up a work station so everything you need is at hand. 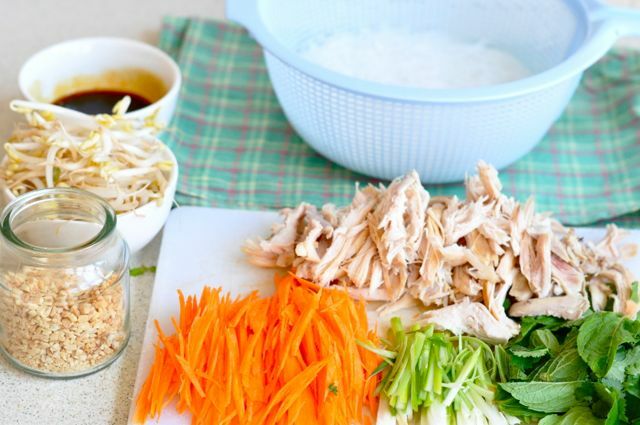 Fill a baking tray with hot water, not scalding, just hot, and dip your rice paper in for 5 seconds. Once upon a time I thought you had to leave it in until it was totally pliable and wet, but you don’t at all. In fact, it still feels quite cardboard-y after 5 seconds but it gets more pliable as it sits, and it’s way more manageable. Smear a small amount of your sauce on the bottom and then add a little bit of your chicken, then your vegetables, then your herbs, bean shoots and top it with some noodles. 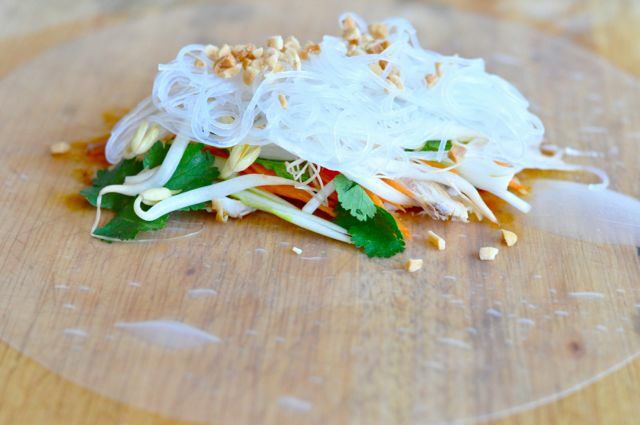 Sprinkle some nuts on top and fold the bottom of your rice paper up, creating a semi-circle. Fold in the sides, one at a time and then simple roll the rest into a neat cigar. Call the first one a practice one, ok? Repeat, and repeat and repeat, until you’re over it or your ingredients are gone. If your first one looks dodgerama, maybe try a little less filling……You’ll be a pro in no time. Why not like my Facebook page right now? Then you’ll not miss what’s going on in my head or my kitchen. If you liked this post subscribe via email now to ensure you can always keep up with the Holsbys. These spring rolls are one of my favourite things to eat and I’m lucky to live in Bankstown where the large Vietnamese population means they are available everywhere! ..and good for you to boot! OMG. Epiphany. Sauce INSIDE. Why didn’t I think of that? I’m forever double dipping and dropping filling into the dipping bowl. You are a culinary genius. 1000 stories before they learn to read themselves? That’s quite a large number. I was a total bookwork when I was a kid. I’d remember having a book in the bathroom with me while I was brushing my teeth, I’d read at the table when we went out for meals. It wasn’t groundbreaking literature (Babysitters Club and Sweetvalley High), but I loved it. HOW CAN YOU SAY SWEET VALLET HIGH IS NOT LITERATURE?????? 1000 paper cranes? Now that’s a different story!!! lol. I beg to differ. 1000 paper cranes. Piece of wees. How old is K now? SWH and Dolly magazine were our pre teen foundations for literature. ….and a fine education in life they were! Holy cow are those statistics for real? That’s so sad. I’m like you: I can’t NOT have a book to read for fun. And yeah Julie and Julia was a good read, although I think she kind of irritated me more in the book though! too neurotic? Yeah, I hear you…..
I’m now reading a great book by the author of Time Traveller’s Wife….Audrey Niffensomethingsomething. She has a divine way with words. Can’t imagine never buying a book again. How very sad. Those are some scary statistics, especially for me as a voracious reader. The scarier statistics floating around at the moment are our younger generation thinking that cooking consists of heating chicken nuggets or making 2-minute noodles – huh? Going back to the rolls, my Mum does a mean steamed bream which replaces the pork and prawns and she makes a wonderful dipping sauce with fish sauce, caster sugar and white vinegar, then squeezes in a bit of lime juice. Also, after wetting rice paper, lay a bit of lettuce (I like butter lettuce rather than iceberg) on the rice paper before adding the other bits and bobs. This adds a bit of texture, plus reinforces the rice paper so it’s less likely to split when rolling. nice tip! That’s great thinking. Yeah, I saw the Jamie Oliver series in the English schools and half the kids didn’t know their vegetables, nor did they know chips were potatoes. Terrifying. mmmmmmhhh these sound delicious !!!!! So so true. Read! Read! Read! Can you believe those stats??? I don’t want to! They are too shocking and scary. I am buying books for everyone I know now! Thank you for visiting my blog and I really enjoyed yours. 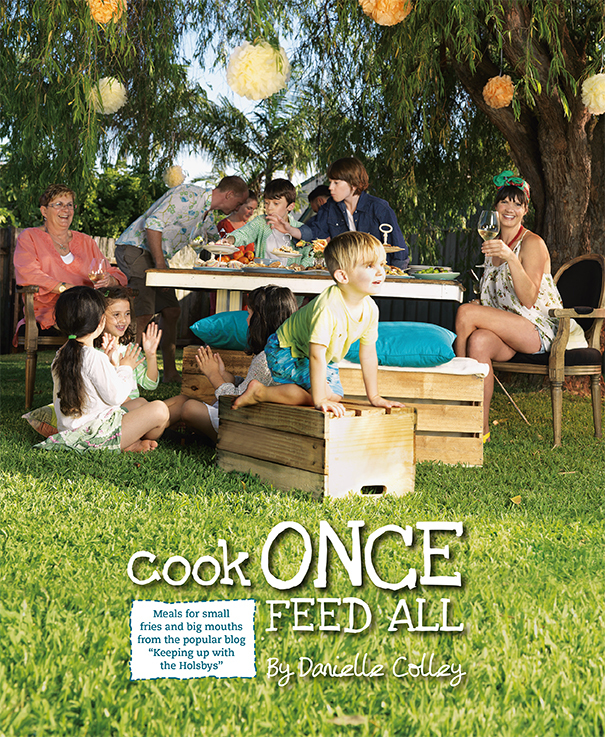 I don’t know what the book reading stats for Australia are like but our household is certainly doing our bit. We are all avid readers. My six year old tells me that she reads by torchlight when she can’t sleep. Books have also been a great bonding thing for me with my kids as I have muscle weakness and struggle to do a lot of physical activities with the kids. That said, lately I’ve been slackening off. Christmas is becoming exhausting. I personally love books and just love hhow they expand my thinking and take me to all sorts of amazing places. The book will never die! how long do these last refridgerated? i want to pack them in school lunches, but i don’t want to make them to far in advance. They are best eaten the day they’re made, however, if you make them in advance, lay a piece of wet kitchen towel over them before glad wrapping to keep them moist. This prevents the rice paper turning into leather. You could have everything chopped and prepped and just quickly roll them in the morning, for absolute freshness, if time permits. These rolls look delicious. I’d love to try making them. I usually just lazily buy the pre-sliced ones at Whole Paycheck. And those book stats make me feel guilty about reading on Google Play. 🙂 Three cheers for real books. Hold Them Close, Whilst Letting Them Go.